Successfully Added HK Warehouse HOMTOM HT7 Quad Core Smartphone - 5.5 Inch 720P Display, Android 5.1, Quad Core CPU, Smart Wake, Dual SIM (White) to your Shopping Cart. 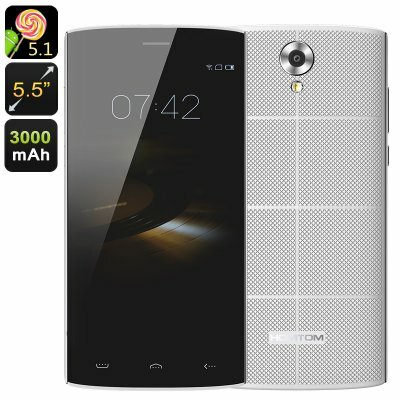 The entry level HOMTOM HT7 is sure to turn some heads with its fantastic array of features including a 5.5 inch 720p display, Android 5.1 OS with smart wake and dual SIM card slots, but what may surprise you the most is the affordable price that is sure to capture the attention of budget phone lovers everywhere. A 1.3GHz quad core MTK chipset with 1GB of RAM brings the HOMTOM HT7 a slick performance that's surprising zippy. Due to the efficient management of the Android 5.1 OS this phone can handle some fairly demanding games as well as multitasking and movie watching without any noticeable difficulties. With its reliable performance the HOMTOM HT7 lets you get the most form its lovely 5.5 inch 720P display, which you will find is more than sufficient form your gaming and movie watching needs. While the 720P screen may be a compromise for those who would like a FHD display its actually a great benefit for the phone as it uses only a modest amount of power, this results in longer battery lifes and means you can enjoy around 12 hours of talk time from the 3000mAh battery or as much as 200 hours in standby. Significantly more than many similar priced devices. Dual SIM card slots provide plenty of connectivity and will offer the option to manage two numbers on the one device, great for organizing work and social life with minimal hassle. Google play comes preinstalled on the HOMTOM HT7 so you can access the best apps and games adding all your favorites to the phone. With a modest 8GB of internal storage you will be happy to know that the phone supports micro SD cards and this will allow and additional 64GB of space to be added. A rear 8MP camera can take detailed landscape photos and even record HD video while the 5MP front shooter is more than enough to bring great looking selfies. The HOMTOM HT7 Smartphone comes with a 12 months warranty, brought to you by the leader in electronic devices as well as wholesale Android phones..
First of all I was concerned about the amazingly affordable price that this phone was being offered at. Not expecting much for the money I was truly surprised to find that this phone exceeded my expectations on all levels. Having owned a number of android cell phones in the past this HomTom HT7 had a quick response to touch showed images clearly, and the ring tone was louder and clearer than my previous phone - all very good points to note. Delivery was excellent from order date to arrival was only 15 days. My uk sim card inserted and activated immediately and calls in and out work perfectly. This cell phone is a gem. In this price bracket it is impossible to fault the outstanding value that this cell phone represents. Only should you compare it to a cell phone costing many times more then you may say that the screen could be better or the speed may be faster. As it stands no bad points to mention. Beat that and all for under €70.